I love Veggie trays when I go to parties. I always cringe when someone brings a store bought veggie tray, as that person spent way to much money on it. 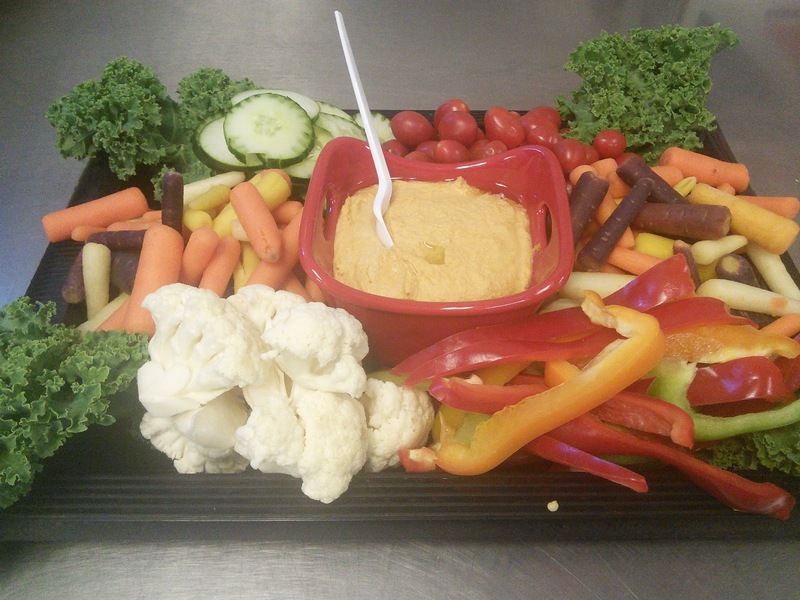 Making a veggie tray is so easy and you can save a lot of money. When you make it yourself you can use unique veggies like rainbow baby carrots, and different colors of peppers. Making a veggie tray is so easy, especially when you have a cool tool like the Deluxe Cook V-Blade Mandoline Slicer. This easy to use mandoline slicer will make preparing veggies for a veggie tray so easy and it will make some awesome looking veggies. This hand held stainless steel slice comes with 4 different cutter attachments so you can make thick or thin slices from veggies. You can even make french fries and hash browns from potatoes. I love that I can make my veggie slices uniform so my veggie tray looks beautiful. This slicer makes slicing veggies so much faster than using a knife and safer too. It comes with 4 different slicing blades that are easy to pop in and out of the slicer. 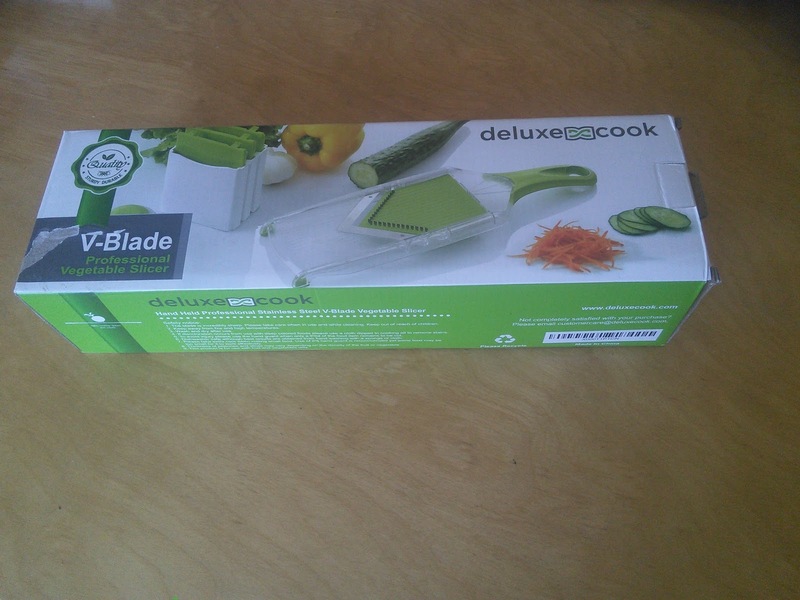 You get 2 blades that make slices and 2 blades that julienne slices. 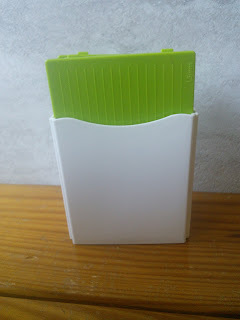 I just love the box where I can store the blades when I am not using them. These blades are sharp! The blades lock in place so they will not fall out while you are using the slicer. The silicone handle & feet makes it easy to hold and it won't slip & slide on the counter. The slicer is even dishwasher safe! Once you try this slicer, you will never go back to a knife and cutting board. Do you have zucchini from your garden? This slicer is great for shredding zucchini to make zucchini bread. 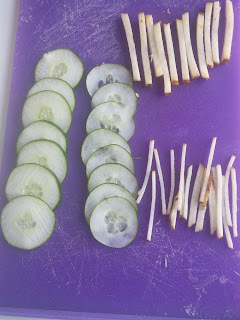 Let me show you the some of the veggies that I sliced with the mandoline. Each of the veggies was made with one of the four blades. I was able to get thick and thin cucumbers. The thin ones would be great for making pickles. The mandoline also gave me two sizes of juline potatoes. The thinner ones would be great for making hash browns while the other would be great for french fries. 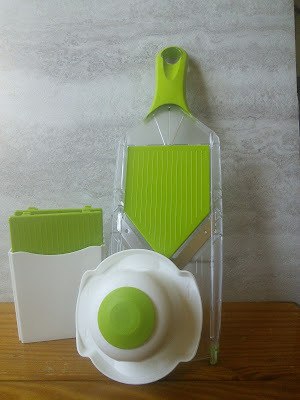 What would you slice with this cool mandoline slicer? 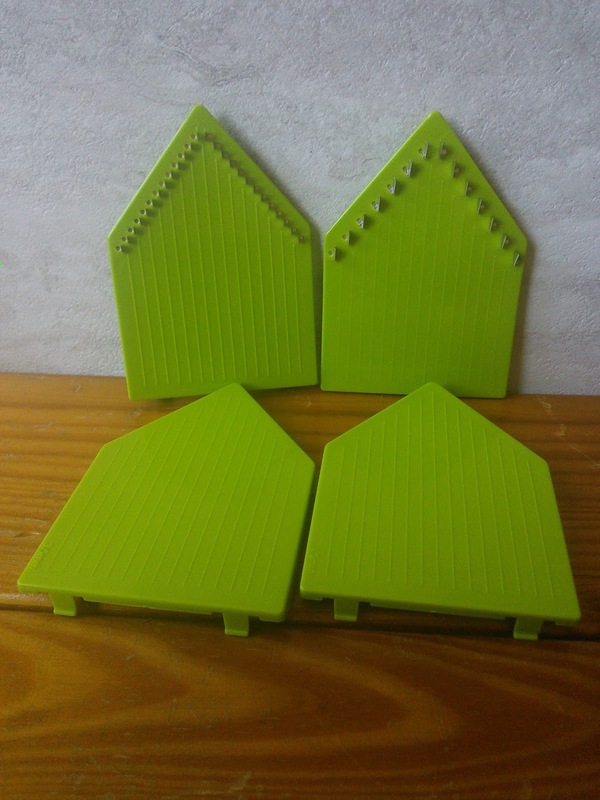 For more information on how you can get one of these cool mandoline slicers and save money on veggie trays, just click on the below link. We host a lot and it is such a pain to cut up all the veggies. I need one of these. I am such a slacker when it comes to making veggie tray. I may have to give this a try. I need a veggie slicer so badly as I am fed up of spending so much time preparing and this looks so simple to use. I love this slicer! I'm going to go check it out :) Thanks for sharing. I love our mandoline! It makes everything so simple and easy! What a HANDY tool! Especially for people like me who LOVE their veggie trays! This is a pretty cool kitchen gadget and I love veggies ! I love this slicer. Great the different blades and cuts it can make. I'm excited now because I have this slicer so I can do these things! Holidays are going to be fun this year. I'd love to have one of these mandolin slicers. It would be a big help putting together veggie trays for family and friends during the holidays. I've paid too much for premade veggie trays from the store. I need one of these to put together my own trays for parties. 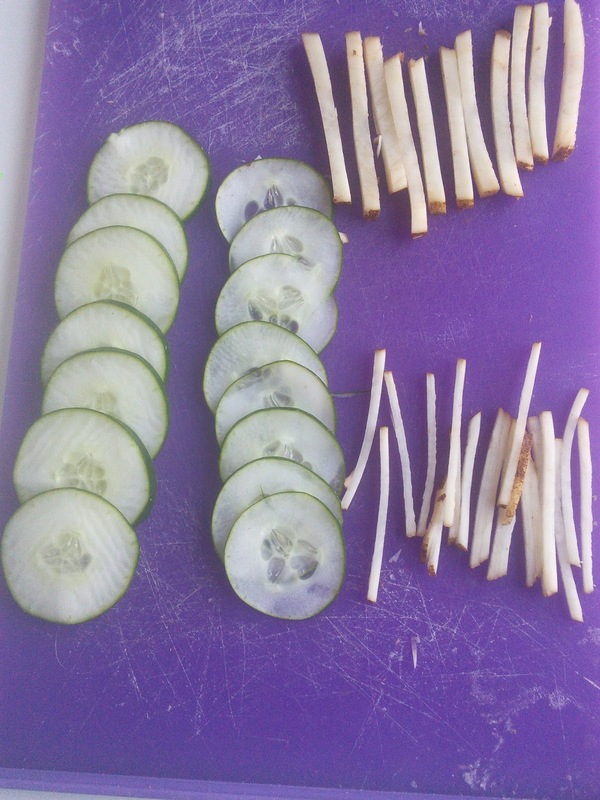 Cutting up veggies is time consuming, especially if you have to cut a lot. The Mandolin is such a great idea. I've always wanted a mandoline slicer. I prefer making my own veggie trays, too so this would be very useful, I'd use it all the time! Need to add it to my wish list this year. I've never owned a mandoline slicer that doesn't easily give up on me... I'm hoping this one would live up to its reputation. I love using this for snacks, salads, and sandwiches. That mandolin looks amazing!! Way better and more complete that the one I have at home!